While planning your event is important, you can't forget the element of promotion. And if you are reading about event marketing, there’s a good chance you are a marketer, right? Well, that’s good, because guess what: You need to market your event! Putting time and effort into an event that no one attends pretty much defeats its purpose. So, a big part of event marketing includes the act of marketing. In the Chapter Four of this event marketing series, we discussed the first steps in how to plan an event. 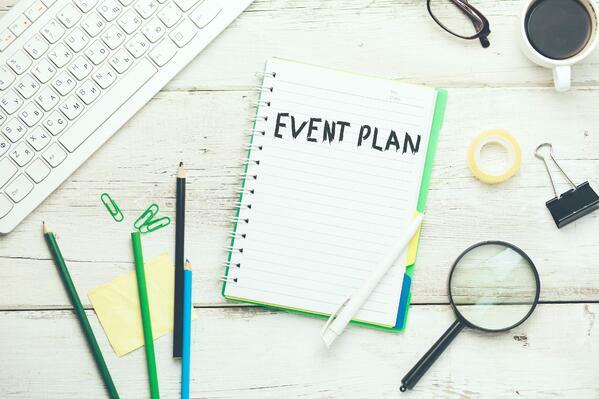 Now that you understand event marketing benefits, as well as the types of event marketing, and you’ve got major event planning logistics in place (yay! ), it’s time to start spreading the word! Brand experience agency FreemanXP polled event professionals in Chicago and Washington D.C., and 67 percent of respondents cited their most significant challenge was growing event attendance. Aside from budget, this ranks right up as one of the top obstacles for event marketers. Thankfully, in today’s digital age there are many ways to go about promoting your event. In this chapter, we will look at 13 of them. These tactics apply to events both big and small, ensuring you will find event promotion tactics that suit your event size, budget, and audience. We will start with the most important elements in promoting your event. In order to grow online registrations, you’ll need an event website with the ability for guests to register. Then, I’ll give you some ways to utilize ticket promotions to sell tickets. After that, we’ll look into the additional channels and tactics to promote your event. As you delve into promoting your event, take comfort. No matter how big or small your budget, and regardless of the size of your database, it is possible to get online registrations rolling in! With that, let's look at the first and most important step when it comes to promoting an event ---your website. If you hear of an event that you want to attend, what’s the first thing you do? Chances are you Google it for more information. Making sure your website has all of the necessary event details is imperative to your success. Get people registered for the event. Get people excited so they want to attend, provide logistical details so they know if they can come, and give the ability to register right then and there. Give your attendees event details. It is common for your event guests to go to the website even after they’ve registered. For example, they may want a reminder of the location, time, or event takeaways. Let's start at the beginning with your event name and description. Who should come to your event? Why should they go? How will you get them excited to attend? Make sure your event tagline gives a quick and engaging summary of your event. Sometimes the shortest copy takes the longest time to write, but it’s worth spending that time for your event landing page. Include a strong value proposition that shows what makes your event unique. Why should someone attend your event over another company’s? 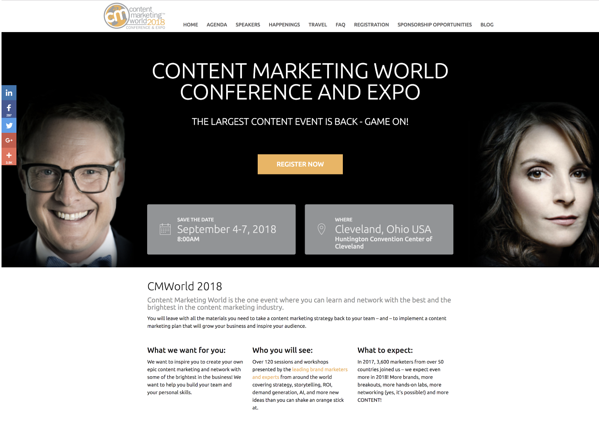 For an example of an effective event website, let’s look at the home page for one of my favorite events, Content Marketing World. It has all of the important details front and center, including the date, location, how to register, and the event takeaways. Oh, and did I mention that Tina Fey will be speaking at this year's event? Yes. As in THE Tina Fey. That is definitely information to include! 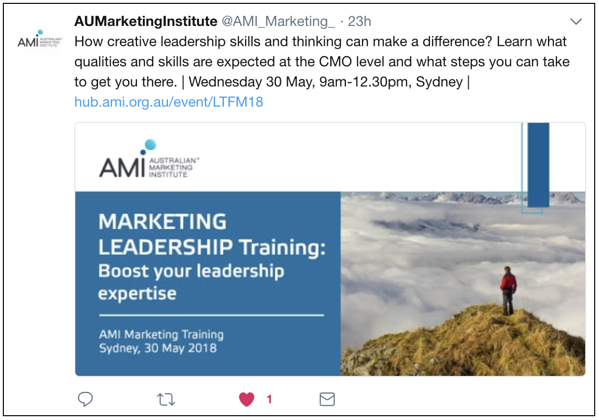 I love the way the Content Marketing Institute has done so by including her headshot. Because there is no additional text, the design remains uncluttered, but it is obvious that Tina is a key part of the event. These are the details discussed in Chapter Four on your event planning fundamentals. Without the date and location, how will people know if they can attend? In the example shown above, notice how Content Marketing World calls attention to these details in two gray boxes. When hosting a business-to-business (B2B) event, include the speaker’s name, company title, and a biography. In this B2B marketing strategy, the biography should focus on the speaker’s authority and influencer status. Include key statistics and highlights from the person’s career to build credibility. Don’t forget to share the lessons attendees will take away and apply to their own jobs. If you are hosting a business-to-consumer (B2C) event with an entertainment act, you can still include a biography, pictures, and resume highlights, and even some video clips of past performances. With either target audience, it’s important to get potential guests excited about your presenters! If your event is free, that is absolutely something to highlight. When charging an event registration fee, you could have multiple ticket prices. For example, at an awards ceremony you might have one ticket price for an individual table and a discounted price per person when a company buys tickets for an entire table of 10 guests. Many events for both B2B and B2C marketers have ticket packages with added benefits for VIP or platinum tickets. These packages could include additional food or drinks, access to an exclusive lounge, or a deluxe swag bag. If any of your ticket packages offer those extra benefits, make sure they are listed right next to the cost on your registration page. So you’ve got your event details, and people are ready to attend. Make that registration easy as pie! Include a big “register” button. This is your No. 1 call-to-action (Also known as CTA in the marketing world). Take a look at this landing page for another event I love: the B2B Marketing Forum by MarketingProfs. Notice how there are two buttons to register. One is in the upper-righthand corner, and the other is front and center with a strong CTA encouraging attendees to save money. The buttons are also both pink, so they stand out – you can't miss them! We’ll discuss event registration more in the next section. When I am considering an event, I can’t stand it when there is no agenda. Okay, the event goes from 5:30 p.m. to 7:30 p.m., but what if you have a meeting that goes until 5:45 p.m.? You’d want to know if the event starts with networking, so you can arrive a little late, or if you’d be interrupting the speaker. B2C events should also have a schedule. Whether it’s an awards ceremony or a festival, people like knowing where they need to be and when. It also gives potential attendees a better idea of what they will get out of your event. Having information on how to get to your event can be very helpful. Is it right next to a train station? Let people know. Is parking available? Is there a specific location you recommend people park? Be sure to include that too. People don’t always plan time for parking. By including that information, you’ll help guests arrive ready to enjoy the event. Kicking off an event isn’t as fun after 20 minutes of searching for parking! For a big event, it’s a great idea to also include FAQs. This can save you emails, phone calls, and questions via your social media profiles. For example, if your event is outside, guests may wonder if they can bring their pets or not. I’m speaking from experience – this is a question I have spent literally 30 frustrated minutes online trying to find the answer to when attending an outdoor art festival! Even with FAQs, there could be questions that arise. I’ve had situations where I can no longer attend an event, and I want to be polite and let the organizers know. However, when there’s no contact details, I can’t do that. Something to consider is that you could have guests with special needs who require you to make specific arrangements. While you may not want to give out your cell phone number, you can share an email address. Create an email address to be used just for events. This will prevent your email address from being put on unwanted sales lists! You can also share the responsibility of checking and responding to emails among co-workers. As just mentioned, having a strong registration call-to-action CTA is a big part of your event website. Having an obvious way for attendees to register for your event should be a given. Whenever it is possible, always include a registration button. If you find yourself in a situation where you don’t have all of the details for registration just yet, make it clear with a Save-the-Date. For example, you may have confirmed your event date and speaker, but some details (such as time and location) are still being finalized. Your event is a month away, and you need to start raising awareness before it’s too late. Providing the ability to register is ideal, but at least with this option it’s clear that registrations are not yet open. That way, you’re not leaving your audience frustrated (like me!) as they search for a way to register. How does online event registration work? 1. Using an event registration and ticketing tool. Event registration and ticketing platforms enable attendees to enter their details and register for your event. After choosing your event software provider, create your account, then add your event on the platform. 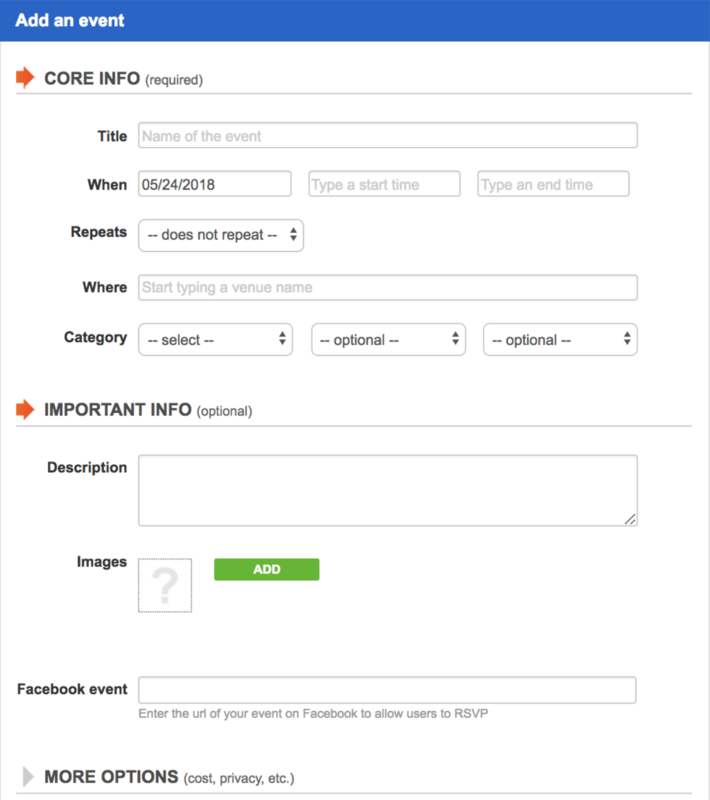 Once your event has been created, embed a form or button to register. This form will lead attendees from your website to the registration platform, where they will pay and enter their contact details. After attendees have started to register, you can view your guest list and monitor the number of registrations. Be sure to check for new attendees after specific promotional activities, such as email sends. This will give you an idea on what tactics work best for your audience. By regularly keeping an eye on the number of registrants, you will know if your numbers are low (time to send more emails!) or if you’re getting close to capacity (hooray!). Some of these platforms will take a percentage of your ticket fees, but if your event is free, then guess what – using that platform is too! Instead of an event management platform, you could have a button that leads to an email. Your contacts will click RSVP, and an email will pop up. Guests can then send an email saying they would like to attend. This is often done for smaller events with no fee. The person managing the registration can then create their own spreadsheet with event guests who have RSVP’d. Discounting your tickets for a limited time is a great way to increase ticket sales. This principle comes down to FOMO -- fear of missing out. This is using the scarcity principle in relation to one’s ability to attend the event. It’s about buying your ticket now, before it’s too late and the event is sold out. In addition to your standard event ticket, this can also be done when you provide a limited number of VIP tickets. This is using the scarcity principle in relation to time and saving money. Many event marketers utilize this tactic with early bird pricing. If you buy your ticket now, you’ll save. And, if you know you are going to attend, why wait? No one wants to waste money! It is essential to get attendees to buy their tickets NOW. Using scarcity and encouraging your target audience to hit that register now button is an effective tool used by marketers hosting events of every size. The best part of using social media to share your event? It’s FREE! Although you can pay for advertising on social media, which I’ll talk about in the next event promotional tactic, you can get results without spending a dime. Perhaps this is why, according to a study by FreemanXP and the Event Marketing Institute, 88 percent of marketers in the U.S. use social media to promote their events and raise brand awareness. 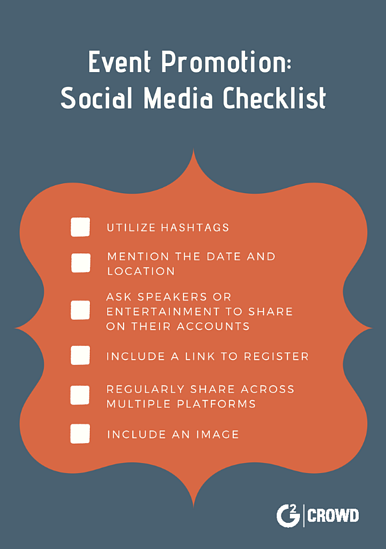 The four major social media platforms you can use to promote your event are Twitter, LinkedIn, Facebook, and Instagram. The target audience for your event will have a significant impact on which platform you focus your time. LinkedIn and Twitter are often the better option if you are running your event for business professionals. On the other hand, if you are promoting an event for consumers, such as food, clothing, or massages, Facebook and Instagram are usually considered to be more effective. Find relevant hashtags related to your event and keep your networks updated with any event news. You want to continue building excitement in the months and weeks leading up to your event. A report by Eventbrite and Buffer states that almost 25 percent of traffic to event registration pages comes from social media. You don’t want to miss one-fourth of your potential registrations! To get the best results from social media, plan time for some trial and error. It may take time to discover how your audience wants to interact with you. But have faith that social media works. If your faith isn’t there quite yet, trust the facts. A Constant Contact study showed that 77 percent of event marketers use social media to market their events, and 74 percent of those doing so found it to be effective. Whichever social media platform you use and whatever text you share there, make sure you always include a link back to your event page where potential guests can get more information and register! Now that we’ve looked at the free ways to use social media, let’s move on to advertising. This entails the paid ways to promote your event, including options on social media. There are many marketing channels on which you can pay to promote your event, including digital and print. If you are hosting a B2C event, consider using newspapers. A local publication could provide you with both print and digital options. Similarly, if you are running a B2B event, you could advertise in an industry trade magazine that will also have both print and digital options. In terms of digital advertising, look into opportunities for display ads. Display ads include square boxes or banners (the rectangles that run across the top of the screen) that you’ll see on the side next to content. You will get exposure on another company’s site, and visitors to that website can click through to your event. Sometimes when you see display ads, they are a form of retargeting: After an individual visits your event website, your event display ad will appear while they are on other websites. In addition to free social media marketing (as discussed above) you can also pay for promoted posts on any channel. When doing so, you have the advantage of choosing specific filters to narrow down your target audience. Paid promotions are available on all channels, but tend to be more expensive on LinkedIn. 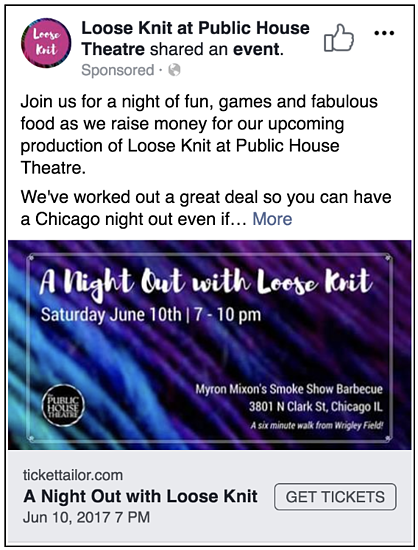 With the filters, I was able to target Facebook users in the city of Chicago, and those with an interest in knitting or theater. Wherever you advertise, consider including a promotional code for a discount. This way, you can track where your registrants are coming from. Then, the next time you are planning an event you know where to focus your advertising dollars. If you do decide to spend money on advertising, be sure to include it in your event budget. Email marketing is one of the most effective ways to get the event registrations rolling in. You have a database of contacts; now it’s time to use it! Be sure to target your emails. If the event is only relevant to some people on your email list, send it only to those contacts. (Not your entire database!) 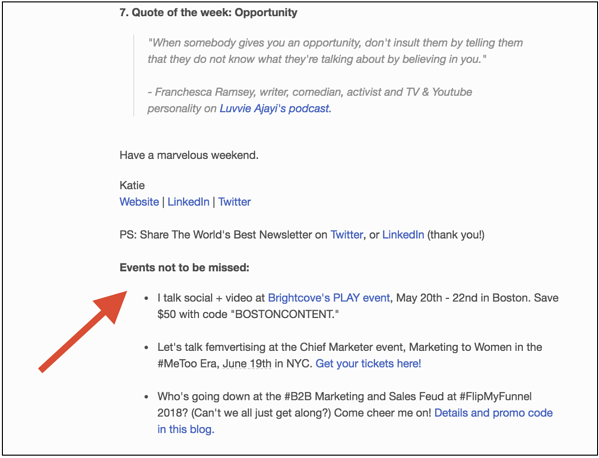 Unless your event is an all-day affair worth the price of a plane ticket, there’s no point emailing San Francisco contacts when your event is in Boston. If time allows, take those who have already registered off of the recipient list for the “register now!” emails you send. Think about it: Once you’ve registered for an event, do you want to receive five more emails telling you “Only 30 tickets remaining!” It doesn’t take much to get annoyed with email overload. And, once someone hits that “unsubscribe” button, you can wave them goodbye. You’ve now lost the chance to promote not only future events, but also anything else to that person. Let’s focus on the best ways to promote your event with email marketing. Here are four best practice guidelines to use in event email marketing. Although it seems like a given, this is so important it must mentioned. It’s not just about emailing your database, it’s about the strategy behind that email. First and foremost, make it clear why contacts should attend your event. Use your email subject line, not just the body of the email, to grab attention so your email will get opened. Think about what time to send your email – when is your audience most likely to open it? Make sure you include the date, time, location, and a link to register. 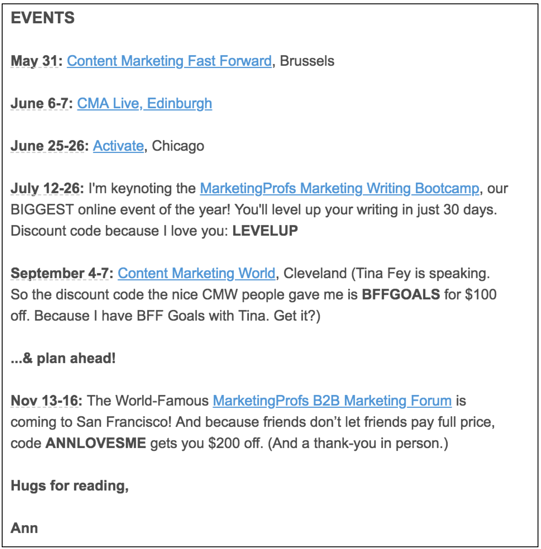 Include your event in newsletters. In addition to emails that are solely promoting your event, include your event in other email marketing campaigns. If you have a regular newsletter, or other content that provides value, be sure you include a mention of your event. This way, if someone doesn’t feel inclined to open an email about your event, you’re still getting them excited to attend. Sending multiple emails on a regular basis, including reminders, will keep you top-of-mind amidst email overload. But be careful you don’t send TOO many emails. Again, you need to find the balance so email recipients don’t unsubscribe. Depending on the size of your event and how much time you have leading up to it, think of sending your emails every few weeks. Include your event in the email signature of yourself and other employees. By doing so, you have a non-invasive way to continually remind contacts of your event. Email signature software is available to ensure your email signature has a strategic and professional execution. Aside from newsletters, your event will now be in every email you send! One of my favorite phrases in marketing is “mutually beneficial relationships.” It’s all about finding opportunities that will benefit both you and another company or individual. When you have a mutually beneficial relationship, you are essentially doubling your audience. Not only can you reach out to your customers and prospects, but you now have the email database and social media followers of another business. Partners who can benefit from promoting your event include your speakers and sponsors. Contact them and ask if they will share the event with their audiences on both social media and email. Here is an example from one of Katie’s emails. 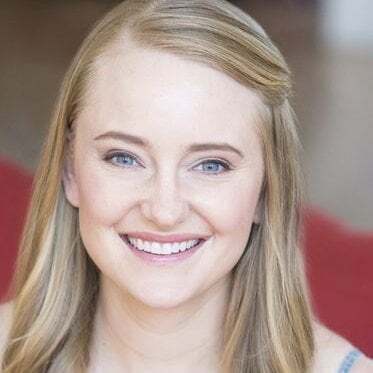 After Katie's sign-off, she alerts subscribers to upcoming events she is speaking at, complete with promo codes and links to buy tickets. Not only do the discount codes provide an incentive to register, Katie also gives brief and exciting details about each event. This gives subscribers insight into the relevance of the event, and entices them to click on the link and learn more. When I saw that she is speaking in my city, guess what was the first thing I did? I clicked on the link for Activate, and checked if I could attend. It’s a perfect example of cross-promotion in action. There is a good chance your speakers will be influencers in their field, which means they will have email subscribers and a strong following on social media. 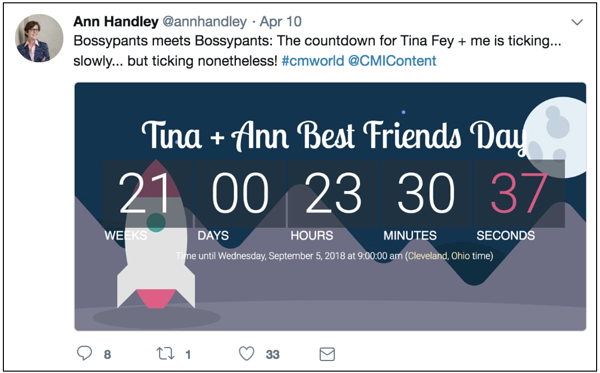 And, speaking of Ann Handley, she is exactly how I found out about the keynote speaker for this year’s Content Marketing World. I immediately let out a little squeal of joy. (Don’t worry, people do much stranger things than that on Chicago trains.) After ignoring the stares of those around me, I went straight to the Content Marketing World website to see details about Tina Fey speaking there. This example shows how influencers grow your audience. They tell followers and subscribers that your event is happening and give reminders that drive traffic to your event website. TIP: Find more speakers like Ann and Katie that your audience is sure to love using the G2 database of women speakers. Getting people to that registration page is one of the most important steps in growing ticket sales. Competitions are a great way to build engagement and excitement for your event. People love the chance to win something, especially if it’s free! When you first announce your event, you can have a competition with the incentive of a free or discounted ticket. For example, those who share your event on social media and tag friends in the post could be entered in a random draw to win a free ticket. Or instead of winning a ticket, registrants could enter to win something at the event. It could be premium seating, a VIP experience, or really anything you can think of! Attendees could be eligible to win in a number of ways, including registering by a certain date or sharing on social media. Whenever you are using competitions, make sure you are aware of and abiding by any legalities. Always check usage guidelines of the platform you are running a competition through, as well as any legalities relating to where the competition is being held. Free publicity can be gained in a variety of ways. One of the first and most common ways to publicize big budget events is through press releases. You can create a press release when your event is announced, and then again whenever you have event-related news to share. For example, you might announce a new internationally known speaker or artist performing at the event. Make sure that your speaker is actually newsworthy, otherwise it’s just a waste of your precious time. If your event is related to a nonprofit, there is an even better chance local news publications will want to cover it. You are providing them with a happy story (we need more of those!) of how a business is helping the community. In addition, think of inviting VIPs or influential bloggers to your event. Ask them to share that they’re attending and provide them with a discount code for their followers to use. This way, you can also track attendance resulting from each influencer. And, as a bonus, if they write about your event after attending, you’ll continue building your audience for future events. For a local B2C event, consider engaging your community for another way to gain awareness. For example, if you are running an event at a local pet shop, you could put up fliers at local dog parks. Your neighborhood may also have a Facebook group where you can share event details. If you have a silent auction or raffle, find ways to get other small businesses involved. Ask them to donate an item, and let them know what they will get in return. Be sure to offer them a shout-out on social media or any other public thanks to expose their brand. In return, they may be willing to put up fliers for your event. Find listings with events for your target audience and get on those lists. Look for opportunities that are both digital and print. If you are a B2C marketer, your city might have local publications with an upcoming events guide. In the digital world, Eventful is a great way to get your name out there. Creating a listing is a free (yay!) and easy process. Once you’ve added your event, you’ll be featured in its Weekly Events Guide. You can also upgrade your listing, giving you benefits such as a premiere placement in Eventful’s weekly newsletter. Whoever your target audience is, there’s a good chance that someone has compiled a list of events for them. If you have a blog, writing content around your events serves both your event and content marketing goals. Interviews with speakers or featured entertainment. You may have a speaker who is willing to write a guest post for your blog. Showing off their expertise displays what a thought leader the person is, giving an extra reason for attendees to book tickets. If a busy speaker doesn’t have time, you can still write about the speaker yourself. Conduct a simple interview. You can do the same thing with any event entertainment. Tips to make the most out of the event. Share your tips and tricks for guests to maximize their experience. Do people need to schedule their day? Are there any keynote speakers or competitions they shouldn’t miss? Mentioning these details will get those who are registered excited for the event, and those who aren’t wanting to attend themselves. Recapping last year’s event. This is another way to build excitement. As potential attendees look at the activities of last year’s event, they’ll start thinking about what they want to participate in or most excited for. Consider it your reminder to take good pictures at this year’s event! Blog posts are an effective way to share your event with guests who might not be on your email list or following you on social media. Don’t forget your personal network. Talk to people you know, invite them to your event, and ask them to share with their friends and co-workers as well. We trust the opinions of peers when making decisions for purchases and pretty much anything else. According to a 2017 report by The Content Marketing Institute and Smartbrief, 80 percent of people cite peer recommendations as the most valuable form of content when making buying decisions. The same principle of peer-influenced purchases also applies to events and registrations. You know what they say: “Time is money.” Even if your event is free, people value their time and don’t want to waste it. A friend or co-worker recommending an event can make all the difference. The word-of-mouth concept also applies to digital conversations. Create an incentivized program encouraging influencers and brand advocates to share the event with their network. Give these influencers a custom link to register for your event so you can track registrants from each individual. 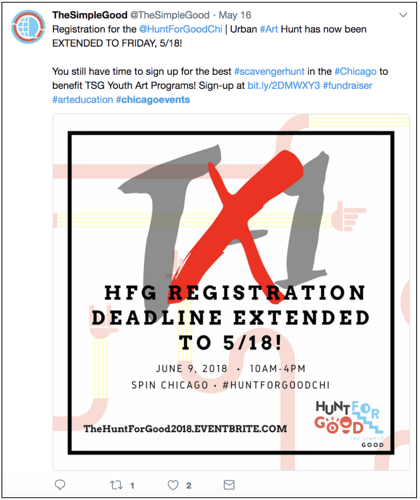 Then, based on how many registrants use their link you can offer them exclusive VIP access, entries into prize drawings, or platinum swag bags. 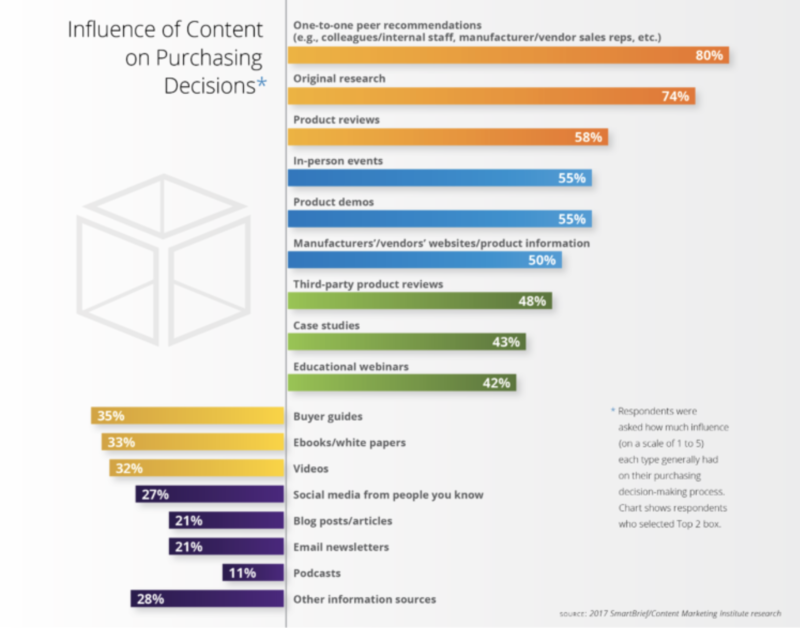 Direct mail is used by both B2B and B2C marketers. Assuming your audience has had interactions with you (meaning you aren’t junk mail), recipients will recognize your company name on the envelope and are more likely to open it. Snail mail can make your message stand out from the many unopened emails we never have time for. And, if you want an added incentive to get your mail opened, include something besides paper in the envelope. This will increase the mailing cost, but the results are worth it. When people can feel there’s something in the envelope, their curiosity will drive them to open it up. Consider the objections that may arise for your potential attendees. Address them, help overcome them, and watch your registration numbers grow. 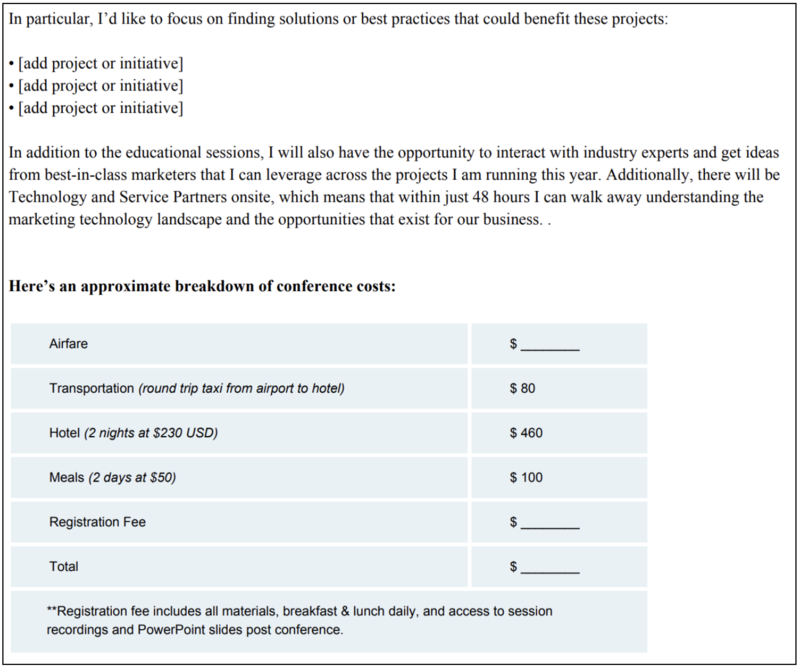 B2B marketers planning conferences have found a great way to do this. They realize there are plenty of professionals who want professional development, but need their boss’ approval to attend. So the marketers assist employees with some persuasion tools and templates to answer the questions a manager will ask. When you click on the button, you’ll find a template that not only convinces your boss, it will get you more excited to attend, too! Here is part of the template provided in the justification letter. It enables you to prove to your boss the direct benefit that your company will receive. I especially appreciate that the letter notes what registering includes. Right next to the cost, managers can see the value. Plus, they will appreciate the recordings and PowerPoint slides that are available after the event. Time isn’t a tactic for promoting your event, but it is most definitely something you need. The more time you have, the better. Aside from getting attendees to register and commit before their calendars fill up, you will have more time to do promotional activities. That extra time allows you to execute multiple tactics. When you discover what works for your audience, you can focus your energies there. Even for a small event, having a minimum of a two months to plan and execute your promotion is ideal. The closer you get to the event day, the longer the to-do list becomes and the shorter the days feel. Dedicating time and resources to promotion is essential to your event’s success. Without it you don’t get registrants, which means you don’t have attendees, and your event is...well...not much of an event. Thankfully, technology provides us with plenty of tricks and tools to reach audiences of every demographic. And, many of them cost you little to nothing. Plus, while promoting your event, you’re also promoting your brand. And, after all, that is the whole purpose of event marketing! Now that your event registrations are beginning to roll in, it’s time to start talking details in Chapter Six - Event Management Details. We’ll take a look at the top 12 event management details you need to prepare leading up to your event day.